Background: Due to the increase in the number of sour wells in today’s oil and gas industry, reservoir souring and related acidizing issues must be considered as an essential concern for material selection which significantly affect the application and performance of alloy steels. Objective: The influence of deposited corrosion product layers on the electrochemical behavior of 13% chromium stainless steel was investigated in an acidic solution to study the effect of a deposited elemental sulfur and FeS layer on the electrochemical behavior of 13% chromium steel with particular emphasis on the role of temperature, chloride concentration and morphological characterization of corrosion products. Method: Cyclic polarization and also linear polarization resistance techniques were applied to measure the corrosion parameters such as corrosion rate, Ecorr, Epit and Ipass of 13% chromium steels at various temperatures and chloride concentrations. All the electrochemical measurements were performed at 25 and 75°C with addition of 0, 10 and 20 g/L NaCl in 0.01 M hydrochloric acid solution. Surface measurement techniques such as SEM, EDS, and AFM were applied for morphological analysis of the corrosion products. 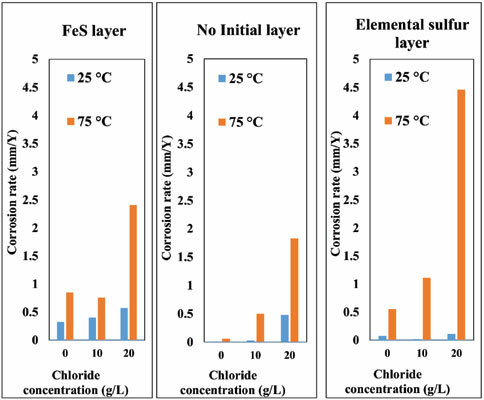 Results: The results showed that both temperature and chloride concentration had significant effects on corrosion parameters; however, these effects on the corrosion rates in the presence of elemental sulfur were significantly higher than those in the presence of an iron sulfide layer or without any initial deposited layer on the sample surface. Conclusion: Environmental variables, such as temperature and chloride concentration have an important role in the corrosion resistance of 13% chromium steel which can indicate either protective or destructive effects on the corrosion behavior of steel. Corrosion product layers, 13% chromium stainless steel, chloride-containing environment, elemental sulfur, electrochemical behavior, iron sulfide.